KayKiSpeaks.com: Ahhh guys... D&G Metallic Oxfords = EVERYTHING! So how cool would anybody be in these shoes??? 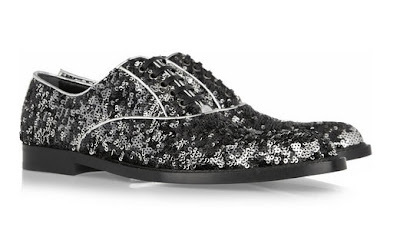 Dolce & Gabbana's Metallic Sequin Leather Oxfords are JUST! Every now and then you want to make a statement w/out having to put on a tall pair of heels. These are definitely statement shoes. Im all about a pair of flats/sneaks from time to time. These bad babies are about $800 online and I feel like I'd wear them in the most inappropriate ways..just because they are flashy! I could see Victor Jackson in these killing the dance floor!